The Dayton Business Journal and WYSO Public Radio in Yellow Springs are doing a series of articles and programs on current innovators. The series is called INNOVATION NOW. 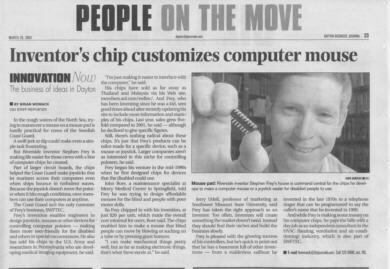 Steve was interviewed in March by the Dayton Business Journal and the article appeared in the March 28, 2003 edition. Brian Womack's article concentrated on the custom mouse controller I.C.s we develope and market. The WYSO radio program was taped the first week of April and aired April 6, 2003 as part of WYSO's Weekend Program hosted by Ryan Warner. The program segment was titled, "Inside the Mind of an Inventor".